Would your customers enjoy quality entertainment? From sport games to digital music, we have it all! We've been serving establishments like yours fro over 25 years, at no additional cost to you! You provide the space and we'll take it from there! Earn extra income and attract more customers! We aim to answer any services calls with 4 - 24 hours! In today's economy we all need extra income and we can do that together with our latest digital internet wall mount MUSIC BOXES (millions of songs), and other amusement devices, such as Space Savings Megatouch (countertops - 80 plus games). Toy Cranes (stuffed animals/prizes). 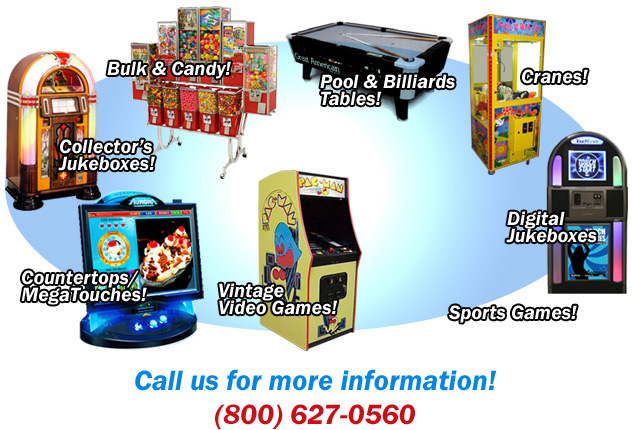 Bulk Candy and Collectibles, and Stand Up and Sit Down Video Driving Games. Our services is Excellent, Personal, and Efficient (usually within 24 hrs.). If you would like to enhance your business and care about personal service - GIVE US A CALL! Copyright © 2009 Epic Amusements. All rights reserved.